Hello all from Fort Worth Texas. This year I became a member of the National BBQ Association and each year they have a conference to get together and celebrate all things Barbeque. With that they have cooking demonstrations. lectures, and Awards of Excellence in BBQ Sauces, Rubs, Snacks, and media, including blogs, photography, podcasts, and so forth. This year we entered all our products. There are folks here from around the world, including Japan, and Australia. I have met so many wonderful folks, and in turn, I have had people come up to me and tell me that they were told that they had to meet me. I have been learning how to increase my business through personal branding, social media, and online presence, and tomorrow I will be taking in some cooking demonstrations. I have had some really great food, and dinner tonight was done by none other that Miss Diva Q! Danielle is one hell of a BBQ queen. she made flank steak tonight that was oh my word!!! I took one bite and only had one word…. DAAAYYYMMMNN!! yeah, it was that delicious! Also tonight they had their Awards of Excellence. 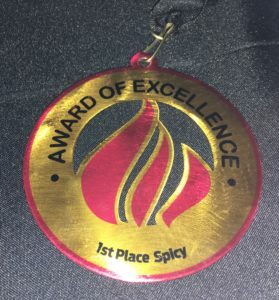 It was a stiff competition with almost 500 submissions in the Sauces and rubs alone. Everyone wants to win. 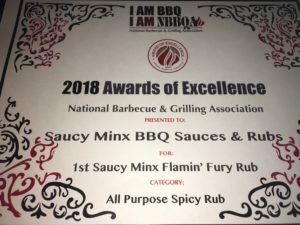 Our Flamin’ Fury rose to the top in Spicy all purpose rub category taking First Place. I live streamed the whole awards on facebook so my family could see back in Oregon if they remembered. I kinda went nuts when they announced me as the winner, I was shocked. Our Tangy Mustard finished 9th in the mustard category. The rest didn’t do as well, but there were so many to taste and judge. Tomorrow is the Peoples Choice awards and these are voted on my the folks here at the festival, so maybe we will win there with something. if not, thats okay, I am here for the connections and information that I have gained. There is always next year. thank you to everyone at the NBBQA for their help and support. This has been an experience I will not soon forget.